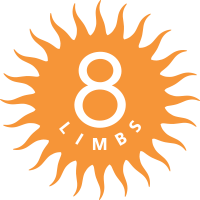 Waaay back in 1997, when 8 Limbs was not yet a year old, I first studied with a teacher named Gary Kraftsow. I had met the workshop host, Yoga Tree founder Kathryn Payne, at a workshop at The Yoga Lodgeon Whidbey Island with Mark Whitwell. Mark had written the Introduction in my very first yoga book, The Heart of Yoga, by TKV Desikachar, and I’d enjoyed his teachings about breath-directed and adaptive asana, and the philosophy of The Yoga Sutra. 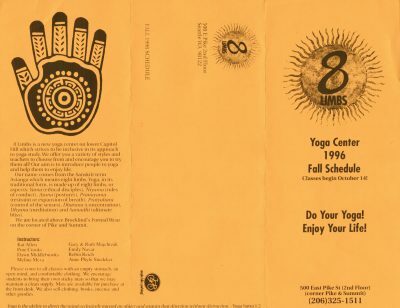 His saying “Do Your Yoga, Enjoy Your Life” wound up on the first 8 Limbs class schedule in the fall of 1996 (pictured at right). Gary, I learned from Kathryn, had studied even more extensively in the same lineage, with Desikachar and his legendary father Krishmacharya. I cleared my schedule and signed up for a four-day seminar with Gary on Viniyoga, the term Krishnamacharya had coined for the yoga he taught in the last third of his 100+-year life. Within the first two hours, I was transfixed. I had received some philosophical teachings in my three years of study, but never had the information been taught so clearly or with such pertinence. Gary gave an overview of the purpose of Hatha Yoga, and an understanding of Sadhana––practice–– that was designed to address the human being at three key levels: developmental (strengths & abilities), therapeutic (philosophy & mental) and spiritual (self-realization & awakening). So many of questions about yoga––where did it come from? what is it really for? what is the progression of practice?––were answered over those next few days. I also learned how to work more deeply with the breath-directed dynamic asana practice we’d worked on with Mark (and similar to what those who study with Douglas Ridings experience as he too studied with one of Krishmacharya’s students). It helped me to teach people of all levels and abilities, and to teach yoga to the individual, rather than bend the individual to the pose. For several years I studied with Gary whenever I could. Melina (8 Limbs Teacher Training Co-Director) joined me for a workshop and quickly followed Gary to his home base in Hawaii to study The Yoga Sutra while on teaching sabbatical. I considered taking Gary’s Teacher Training, but it was too much time away from the studio at a time when I was the only person to manage things. After a few years, Gary stopped coming to Seattle, and I found new teachers that fed my hunger to learn. But I kept teaching what I’d learned from him. I revisited my notes. I read all of his books. I taught what I’d learned in my classes and in our own Teacher Training. I kept the fire going. A few years ago I decided to reach out to Gary. I became aware that he was one of a handful of American yoga teachers that holds such a comprehensive understanding of the breadth of yoga––how it can both be immediately helpful to a physical body and take us to the far reaches of consciousness. I wanted to bring him back to Seattle, both for my own desire to learn more, and to share his teachings with our amazing Seattle sangha. 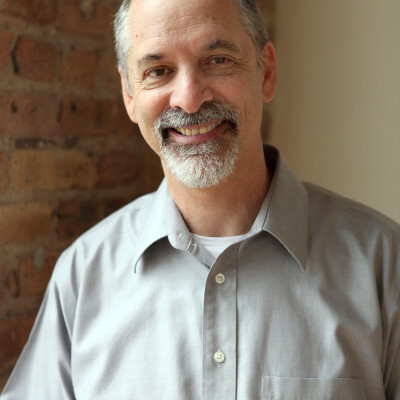 Gary Kraftsow returns to Seattle May 20-22* to teach at The Summit, one block from 8 Limbs Capitol Hill. I sincerely recommend all dedicated yoga practitioners consider this great opportunity (and to me, privilege) to study with a true master of yoga. No matter whether the subject appeals to you, you will experience, both through practice and lecture, a nuanced and practical approach to yoga, and life. Join me!